Household Vacuum Cleaners Market size in 2015 was over USD 12 billion, it will grow at over 4.5% CAGR estimation from 2016 to 2024. Global shipments are forecast to surpass 130 million units by 2024. 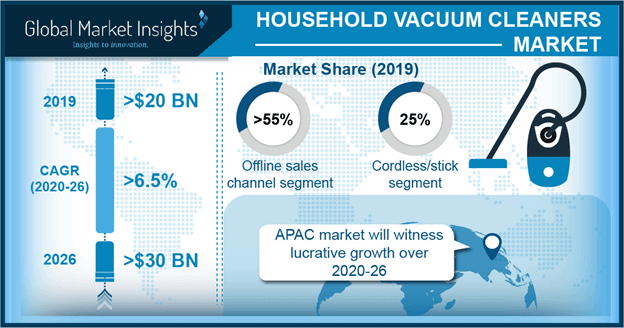 Growing purchasing power and disposable income will drive the household vacuum cleaners market demand. Growing hygiene and health concerns coupled with automated and quick cleaning solutions have also driven the industry. Improved standards of living and rising urban population in developing countries will support the household vacuum cleaners market growth. The evolving consumer preference landscape has driven the demand for technologically advanced products. Manufacturers are providing a wide variety of products to cater to the demand of various consumers. They focus on developing superior-quality, high-performance, and cost-effective products to attract consumers. Manufacturers are responding to consumers by incorporating new features such as robotic operation, bag-less technology, HEPA filtration, and cyclonic technology. High-efficiency particulate filtration removes about 99.97% of all particles with a diameter of 0.3 microns or more. A sealed system of product ensures that all air entering the vacuum should first pass through this filter before being exhausted. It is beneficial in removing particles that cause asthma and allergy, and prevents these particles being returned into the air via the vacuum’s exhaust. Cordless vacuum cleaners market accounted for about 9% of the revenue in 2015. Benefits such as portability and minor stain vacuuming will drive the industry growth. Moreover, easy mobility, hassle-free cord less operation, ease of use, and quicker cleaning operations will support the industry growth. Most of the cordless products are bag-less, which eliminate the need to buy extra equipment or stockpiling bags. Robotic vacuum cleaners market size was over USD 1 billion in 2015. These devices are ideal for people with mobility issues and have advanced features assuring better cleaning. Moreover, compact design and minimal maintenance will also fuel the household vacuum cleaners market demand. Major barriers to adoption of cordless and stick models include possible battery issues, which may limit growth potential. Ensuring that the battery is always charged often presents a problem for the user. Some products have extended battery life since they are equipped with a less powerful motor. Aftersales service is a major buying criterion. U.S. household vacuum cleaners market share will grow at over 4% CAGR. The popularity of bag-less and multi-surface products will support the industry demand. Increasing disposable income, rising health awareness, and improved standards of living will support the APAC industry demand. Rising consumer preference switch from conventional cleaning processes to automated cleaning solutions will also support the household vacuum cleaners market size. As per the directive 2009/125/EC of commission regulation (EU) No 666/2013, the power of vacuum should be less than 1,600 watts till 2016 and it is reduced to 900 watts from 2017. The electricity consumption should be less than 62 kWh per annum and in 2017, it should be reduced to 43 kWh per annum. This law mandates the display of energy labels by the retailers (brick and mortar, catalog, and on-line retailers). This change stated by the EU law provides guidelines to manufacturers to produce eco-friendly vacuum cleaners with slight changes in 2016 and for products from 2017. The household vacuum cleaners market is characterised by a few established players acquiring major industry share. Offering differentiated products is the prime strategy followed by companies. Dyson, Hoover (TTI), Bissell, Oreck, LG, Electrolux, Haier, and Miele are some of the industry participants. The entry barriers in the industry are high owing to the presence of established brands in the market. Major companies that hold a substantial household vacuum cleaners market share and have attained economies of scale restrict the entry of new competitors in the industry. Expensive technology requirements to match the products of the established brands pose high threats to new entrants. Stringent regulations regarding electrical safety and energy consumption to be followed by the companies require a high investment in R&D to design the product. In October 2016, Bissell introduced CrossWave, a multi-surface cleaning system which is capable of vacuuming and washing the floors at the same time. With this floor care advancement in vacuum cleaners, Bissell is targeting 85% of households that are still using manual floor cleaning techniques. Vacuum cleaners are one of the handiest tools for cleaning homes. They offer an effective way for cleaning floors and reduce the risk of allergies by purifying the air quality. It utilizes an air pump for creating vacuum and extracting dust and dirt from upholsteries, draperies, and floors. It contains a dust bag or cycle, which has the capacity to store a significant amount of dust for disposal purpose. The trend of smaller housing options coupled with need for higher degree of convenience will also lead to the cordless modality being adopted as a secondary option in houses with traditional vacuum cleaners. The electricity consumption for an average vacuum cleaner ranges between 500 watts and 2,200 watts. Regions with relatively lower average disposable incomes are cost sensitive and the energy consumption by these products may discourage consumers, adversely impacting the household vacuum cleaners market.